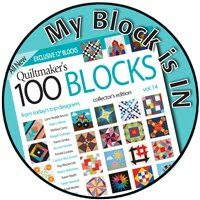 Welcome to my block stop on volume 15 of Quiltmaker's 100 Blocks magazine. 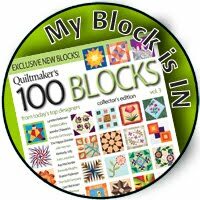 It's always fun to find out a block gets accepted into the magazine - it's even more fun when you discover your block made it to the cover! 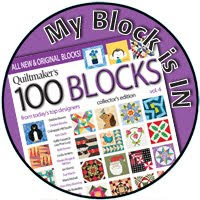 I've been asking my newsletter subscribers and blog readers if they could guess which block was mine. . . 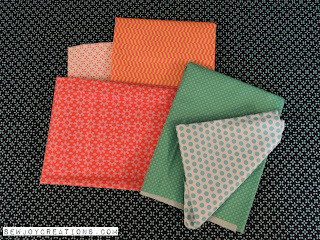 I knew that I wanted to use Janine Vangool's fabric line, Uppercase, for my block - she's Canadian too, eh! In the process of making the block I had to decide whether to use a light or a dark background. Here is my test layout of some different Uppercase prints using a light background. I decided that I liked how the colors popped on the dark background more so I went with the dark background. Then of course, I had to make more! 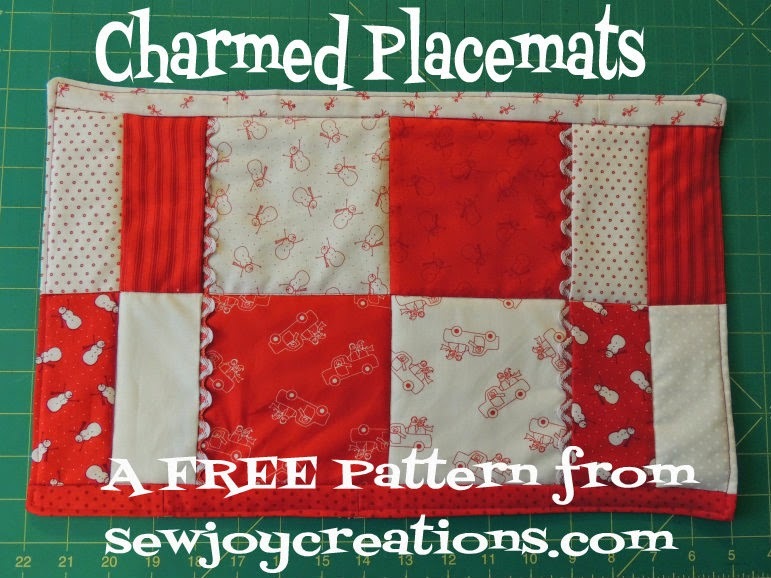 The theme of this volume's blog tour is a road rally and that inspired my quilt. I set my blocks on point to look like a field of tulips. Tulips in Canada's capital city, Ottawa, and the month of May are a tradition. If you don't live too far away it is definitely worth a road trip! Since I live too far away, I decided to make a field of tulips to enjoy on my own bed. 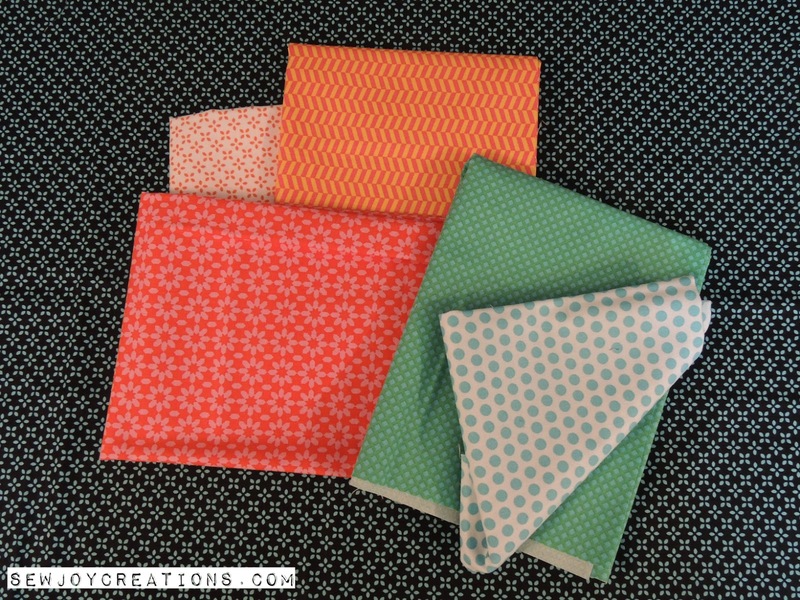 I used one of the light prints in Uppercase and a Pat Sloan print for my tulip block backgrounds. Then I had fun making some bright, mostly red tulips. Fun tulip fact - there is a special Canada 150 tulip! Canada is celebrating it's 150th birthday this year with many special events and souvenirs to mark the occasion. I'm considering my quilt to be a 150 birthday quilt - hopefully it will even get quilted this year! Since I'm in the celebrating spirit, I am currently working on this NEW block called "Celebration Leaves". It's big at 16" and lots of fun to play with AND it will only be available to my newsletter subscribers, so, if you like it, sign up! 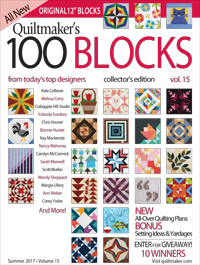 Hopefully I've inspired you to make a tulip block or visit a local festival - maybe your road trip will be to the nearest quilt shop for a copy of the Quiltmaker's 100 magazine and some fabric! or one that's worth a road trip! Thanks for visiting! 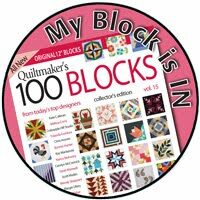 Keep on touring with Quiltmaker's block stops for today. I guess we go for the local Strawberry and Apple Festival but really here it's all about State Fairs. I don't attend festivals, but I do like going to the North Alabama State Fair and seeing all the beautiful quilts and crafts. I have submitted a few of my quilts and they won first, second or third place. Thank you for your block. My favorite local festival is Celtic Fest in Bethlehem, PA. It occurs every September and the music and artisans are wonderful. We always try to go to the Folklore Festival in Thunder Bay, ON It is happening this weekend and we have great weather to travel and enjoy the great food and entertainment!! We always go to our local Strawberry Festival--a weekend full of music, artisans, and delicious strawberry shortcake! great story to go with the block. We have not visited any local festivals - we must be boring! I did go to the Quilt Festival in Shipshewana, IN, last year, though! We have a lot of festivals here but my favorite is Island Fest, arts and crafts with great food. 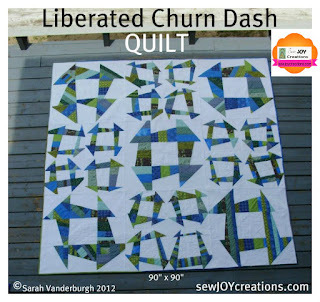 Churn Dash is one of my favorite blocks! And your beautiful Tulip block may soon be one too! Our quilt club holds it's annual quilt show during the Cranberry Blossom Festival, Wisconsin Rapids, WI. It is coming up in June....come on down!! The Bayfield Apple Festival in Bayfield WI is a good time! I liked your sharing of auditioning backgrounds. 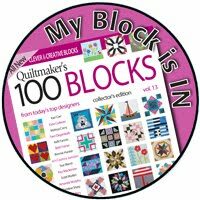 Isn't it true that the right choice just seems to jump out and say, "choose me, choose me"
When this QM's 100 Blocks Blog Tour is over and I did not have the luck to win my own copy of this exclusive magazine, I will be going on a road trip to buy the magazine as well as fabric. Love your block and your colors. As far as local festivals, there seems to be always somewhere to go. If not festivals, we always have a fair sometime in summer to enjoy. Thank you for being a part of this Blog Tour and the possibility to try and win that magazine OR Road Trip here I come. Our town is known as the Almond Capital of the World and we have an annual Almond Blossom Festival the last full weekend in February that we attend. 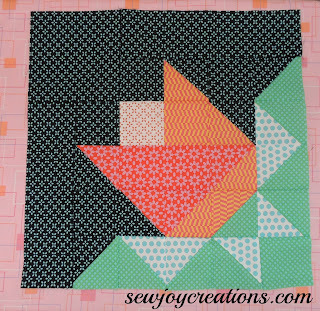 Your tulip block is great! I love floral blocks and tulips especially. It would be fun to go on a road trip to a tulip festival. I love your churn dash patterns also, there is just something special about churn dashes that always catch my eye. In the fall we go to the Barberton Mum Fest. congratulations. your block is lovely. I would love to go on a trip to see all kinds of variety's of tulips. our botanical gardens has many flowers and plants but only a few types of tulips. If I could, I'd go to Roundtop, Texas for the Antique Week either in Spring of Rall. So far, I haven't found the time. :-/ I often go to Fredericksburg, Texas for a variety of events. As a Houstonian, I go to the International Quilt Festival every year! But I also like to visit the Texas Renaissance Festival in Magnolia and the Texian Market Days at the George Ranch Historical Park in Richmond. We don't have local festivals, but we do have fairs. Those are fun. My favorite isn't a festival, but it is the Quilt Expo that is held in Madison, WI. 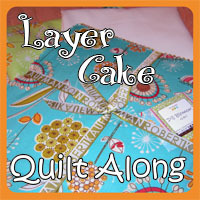 3 days of classes, quilts, vendors, etc. My favourite is the Herbstmesse here in Basel, Switzerland. Just love the smell of the different foods and the special atmosphere. I loved the tulip festival just outside Seattle that I went to many years ago! Amazing - I would love to go to a hot air balloon festival! Boise has a TreeFort Festival each year that highlights local music as well as "sub Fort" activities such as HackFort, which is a software developers chance to showcase innovative apps and other technology, or KidFort (this year the kids made cardboard forts) or ComedyFort or FilmFort. Lots and lots of interesting, fun stuff. I live in The Netherlands and lots of Tulpis are growing here on the fields. I like them Spring is there when we see this flowers. I live in a small town (used to live in the New Orleans area, where they know how to do festivals!) so I can't bring myself to go to any here! LOL! 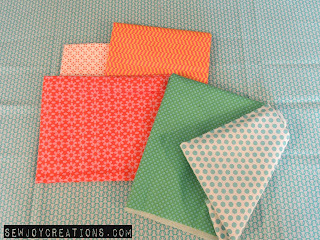 Cheerful block perfect for Spring! If you are near Pequot Lakes MN in the summer, you can't beat Bean Hole Days! Yes, the beans are cooked in a hole and served to attendees--yum! I love the tulip block and the photos. What a great quilt. Virginia City, not far from me, has a Mountain Oyster festival that is interesting to go to. I elect to sample other dishes, though. Great Tulip quilt and it would be great to see the flowers at the festival. I'm in the UK and I live not far from Cheltenham which has a great science festival next month! Great tulip block, It is so nice To see the tulips blooming after our long winters. I enjoy our Strawberry festival, lots of fun. The best festival in the town where we live is Summer Motion which is several days around the 4th of July and includes lots of free entertainment. I very seldom get to go though, because that's when my family (in another state) has a big family get together. We have River Fest here in Kansas went when I was younger not so much now..
drhodes9@cox.net LOve tulips.. my oldest daughters favorite flower always looking for those.. I enjoy going to the Arrow Rock craft festival in Missouri. My quilt guild has its annual quilt show there as well. We have an 11 day Apple Blossom festival going on right now here in central Washington State. Lots of good food, parades, car shows and much more. The International Quilt Festival in Houston, TX. I go to a local fibre festival which is so much fun. Our best local festival is the Bucyrus (Ohio) Bratwurst Festival, celebrating all things sausage and anything else edible. It's nickname is "The Eatingest Festival in Ohio." Hubby and I went to a kite flying festival last year and it was so much fun we are going back this year in just a few weeks. It was like a ballet in the sky! We have a spiedi fest the first weekend in August and it's wonderful. Spiedis are chicken, pork, lamb chunks marinated in a special sauce, skewered and grilled. During this fest, we also have hot air balloons and its nice to see them in the air. Thanks for a chance to win. Your block is beautiful! My favorite festival is the International Quilt Festival in Houston! I don't get to go every year, but when I do, several of my friends load up the car and make the 5 hour trip, spend a couple of days, spend lots of money, take lots of pictures and have a great girls weekend. I like to go to Steam Engine Days. They have a small quilt show and the quilts are lovely. Your tulip block is a winner. Tulips are a favorite flower of mine and I have several hundred red and yellow ones in bloom right now.Thanks for the chance to win. I love going on my annual quilt shop hop, but several of the stores have closed, so I'm not sure what I'm going to do this year. Haven't been to a festival in many moons...however I do go to Road to California Quilters Conference and Convention in January. 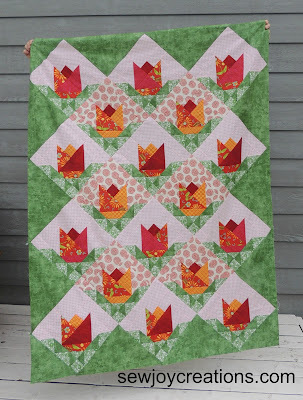 I love your block and really, really love the quilt. Thank you for your giveaway. I love to go to our Mountain Laural Vestival every year. It is coming up in just a couple of more weeks. Our big festival is the Wichita River Festival. Lots of fun activities and of course great food. Many years ago there was a "Red Flannel Festival" in Cedar Springs, MI home of the red flannel pjs and union suits! It was a fun winter time festival in a small town and everyone showed up. One year my grandparents were the "King and Queen!". It's about a 2 hour drive from my house. 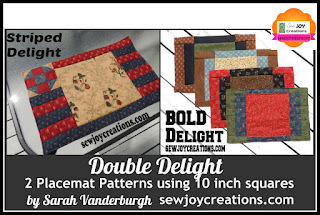 Well Sarah, love love the tulip block and your tulip quilt! And the local festival I visit is the Tulip Festival in Ottawa since I live in the area...LOL. Great block! In the spring I like to go to the Pickens Azalea Festival. There are some fun quilt hops in Florida during the Summer. Ga has some quilt shows in the Spring. Mo has county roads trip seeing the sites and shopping for fabric. Mo Star- Quilt town is worth seeing and fun day shopping all the different quilt stores. I think it mainly along Mo. Route Highway 36. I made a Tulip quilt last year in pinks. The Tulip Festival would be neat to see. My favorite quilt festival (well the only one I've been to) is the Vermont quilt Festival, held in Essex Jct, VT.
No festivals for me .... all too far away. But reading all these comments I sure could add a few to my bucket list!! Ham & Yam Festival is this weekend in Smithfield, NC: kids decorating yams; sweet potato pie eating contest; rubber duck race; barbecue cook-off; and lots of music. Love your block. Thanks. The Shrimpboat Festival in Ferninadina Beach, Florida is a fun weekend. Congratulations on having your block included in this issue. Our local Strawberry Festival is next weekend - Mother's Day. Makes for a great double celebration. There is a fun Strawberry Festival on Vashon Island, WA that is not only a road trip but a ferry ride! We want to go back to Ohio and go to the smallest World Fair in Bellville. My town has an annual pet parade each summer. The entire parade is made up of children. Some have their pets with them, others don't. Many dress up in costumes and it is always fun watching the parade. I have fond memories of being in the parade with my brother when I was 8. We even won a prize. I don't remember what it was, but I remember having fun. We have the Scandinavian Festival which highlights the culture of a different country each day in art, music, dance and crafts. thanks. reply to pjrquilter (at) msn (dot)com. These festivals sound like so much fun. I come from Southern Cal, and I remember the sand castle building festivals we would have, although I don't know if they are still going on. The ones I see now are filled with professional sand castle builders, if you can believe it. Amazing to see, although a bit less joyful than when the less perfect amateurs were building their sandy works of art. I'd love to go to Lindstrom MN for their Karl Oskar Days. My mom was born on a farm outside of town and the celebration is the perfect excuse to visit with family and celebrate my Swedish heritage. If I am ever off work on Labor Day weekend, I want to go to Swiss Days in Midway, Utah. I have heard that it is so fun. When it rains, there are beautiful wild flowers in the desert. http://www.abdnha.org/pages/03flora/reports/current.htm Had a great day a few weeks ago actually going in the desert to see things. Beautiful! Thanks for the chance! My town of Payson, Utah has the Scottish Festival every July. It's so much fun--great music, dancing, vendors of jewelry and costumes, battle of the bagpipe bands, and Highland sports. I really want to attend the Panguitch Quilt Walk Festival in Panguitch, Utah, in June! It's celebrating the winter when The pioneers used quilts to walk on top of heavy snow, to get through a snowed-in canyon for supplies to save their town. Quilt show, theater telling of the story, food, classes, and plenty of outdoor activities and nearby camping in Utah's canyon country. 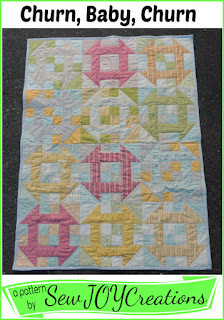 And of course, I'm heading to UQSM quilt show in Sandy, Utah, tomorrow! Where I live in Illinois there is a weekly concert series with a famous band each week in July and it's only a few blocks from where I live. I think one band this year is Kool and the Gang. That's about as festival-ly as I would attend. I live on an island in Alaska and we have a marathon at the end of May. Some of my friends have talked me into running 3 miles, as we will be a relay team. I am young in spirit, but old in age (70) and invite you to watch this old lady walk here 3 miles...it will be a sight to see. Love your block. I love going to the Detroit Freedom festival and one of the highlights is the fireworks over the Detroit River between Michigan and Canada! Celebrating both countries freedoms! thank you! I gather my peeps and we go to Madison to the annual quilt festival put on by Nancy Zieman and the local PBS. It is always lots of laughs along the way, plus great quilts and shopping! I used to live in the Skagit Valley in Washington. We have a marvelous tulip festival there. We always try to go to a a Highland Games each year, too. I live in Cambria, California. Down the road in Cayucos we have the yearly Seaglass Festival in March. Interesting and beautiful found art! Thank you for the giveaway! We have a great summer music festival in Bethlehem, PA, with lots of free concerts. One of our local hospitals always has a strawberry festival that we have enjoyed. We have many festivals in this area too many too many to chose from. But if I have to name one we have Chocolate Fest the first weekend in June in our small town. Merrie Monarch Hula Festival in Hilo, Hawaii (Big Island). It's amazing to see the beautiful hula dances. Syttende Mai (Norwegian Independence Day is May 17th) celebrations in May are fun. The weather doesn't always cooperate though! We like to go to the Wool & Sheep festival and the Renaissance Festival. We have an annual "Ranch Expo" with lots of ranching related vendors--machinery as well as clothing, home decor, and a small quilt show in an old church on the grounds! I love food festivals! When I lived in Connecticut, I loved the Oyster Festival. Here in South Florida, the Chocolate festival has been my favorite. My favorite is Steam Engine Days. They have a lovely quilt show that shouldn't be missed. Tulips are my favorite flower. I love how your block sets them on the diagonal. 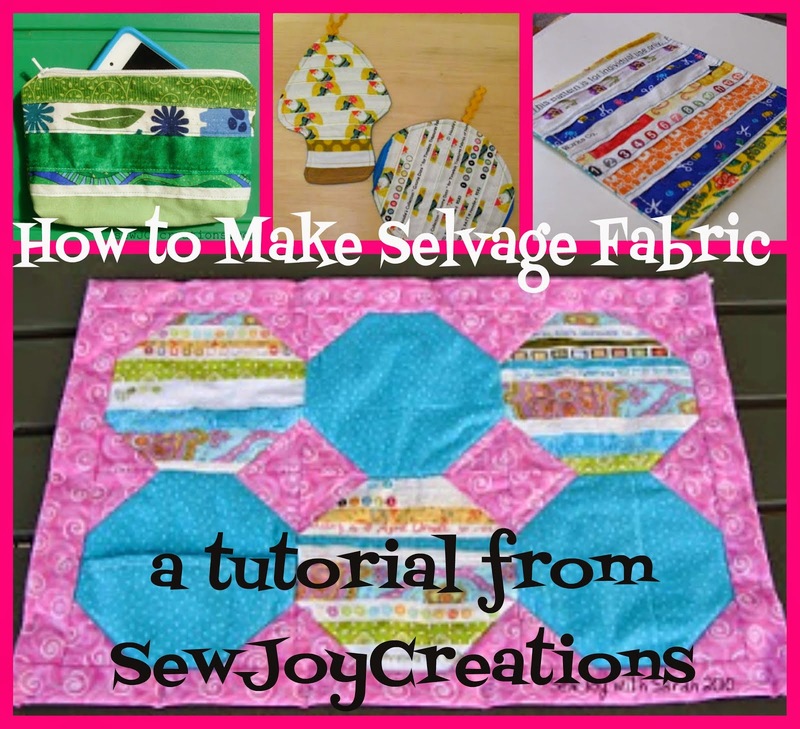 This is a must make block for me! Sadly, my life has been rather hectic the past few years so that I have not been to any festivals. I enjoyed reading about all the great festivals that others have been to. A very big favorite festival in this part of Pennsylvania is in Franklin, PA. It's called Applefest and it is a dandy! Perfectly timed in the fall when thoughts are turning towards early Christmas shopping, it always draws big crowds. I love Road to California! Would love to go this year, Hope I can make It. Also Sisters is worth the trip! Like your sweet block. Congratulations for being in the magazine. I love the tulip block. It's perfect for spring. Congratulations! Tulip blocks are some of my favorites. Yours is cute. Your liberated churn dash is on my bucket list. And now your tulip block. I like the dark background. Thanks for the chance to win! We have few festivals in my area. But a few hours away there are great apple festivals!